I will open with this general observation: we fail to read enough biographies in our growth as Christians. I think there is a heartfelt desire to avoid the hagiographical style where our “heroes” did no wrong, and so we tend to avoid biographies in general. Alongside that, we fear elevating individuals too highly, but we would do well to remember that Anselm’s ego will not be overinflated, nor will Lady Jane Grey, Dietrich Bonhoeffer, or many others. There is no real risk here, and we are the poorer for allowing modern denominational lines to block our view of history. Now, let us move on to Anselm of Canterbury. Anselm falls into church history as a theologian of the eleventh century and is considered one of the founders of scholasticism, the effort originally geared toward defending the Christian faith on an intellectual basis. More than this, Anselm was heavily involved in the conflicts of his age between the English King and the Pope over the power within the church. These conflicts are part of the heritage of the separation of church and state to this day: the King wanted to have the power over the church in his lands, and the Pope wanted the church independent. Anselm also fought to reform the church and even wrote against slavery. Anselm of Canterbury, though, is a biography for younger readers, and so does not quite dig into all of these issues. There is an examination of Anselm’s childhood, including an interesting story about white bread. Carr also draws out some of Anselm’s experiences s a younger monk, establishing who he was before he became Doctor Magnificus of the Roman Catholic Church. Even then, though, he was groundbreaking. Page 21 shows how he used a tablet to record his ideas—he did have some printer-compatibility issues, though. Carr’s storytelling style is excellent throughout. Even though I am aware that I am reading a children’s book, it is still engaging and challenging for an adult reader. My kids have enjoyed reading it, even not understanding all of the undercurrents of history about lay investiture or homage. The story is compelling, and I think Carr handles the theological questions well enough for younger children to grasp. She does an excellent job being even-handed with her treatment of the structure of the Roman Catholic Church, neither fully endorsing it nor introducing unnecessary questions about the medieval church systems. 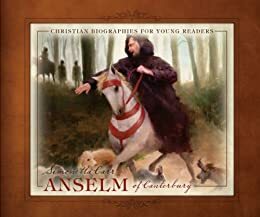 Overall, Anselm of Canterbury hits the midline between simplifying the story enough for children and not dumbing the story down too much to have value. The “Did You Know?” section in the back is very helpful, filling out the details needed for the life of Anselm. Further, a few definite quotes from Anselm round the work out nicely. I highly recommend this book for upper elementary and above. Please Note: Cross-Focused Reviews tracked down a free copy of this book and gave it to me, on condition that I review it. No demand was made that I like it.